Recently I have had one of my photos compared to the work of Alex Webb. This compliment was praise indeed and came from an accomplished photographer, who has spent a significant amount of time as my mentor and teacher. It is amazing how a kind word can help push us all to create further images. Alex Webb was one of the youngest members of Magnum. He started with B&W film, moving to colour in 1978. Colours tend to be muted and dark shadows will leave much of his photographs to the imagination. He states he has, ‘chosen to wander the streets of places where political and social tensions lie more on the surface, places where life often seems lived on the stoop or in the street’. Alex Webb seeks a raw version of the street. A large part of his portfolio was shot using Kodachrome, famous for its rich, saturated colours and dark blacks. Much of his work was undertaken in the tropics, and harsh sunlight taught him how to take advantage of high contrasting light situations. In his pictures, there are multiple layers and frames within frames. His pictures display a deep understanding of how colours combine, and this skill, combined with the inherent deep shadows found in tropical locations draw the reader ever inwards to solve the hidden riddles within each photograph. Great artists steal, this is one artist whose ideas are worth such theft! Plan your day to take advantage of the light. Midday is often a time when images can look quite flat, but can provide opportunities for striking shadows that swallow hidden secrets. Look for a striking backdrop. Then wait to see what plays appear on the stage. Research your location and get a feel for the place. Don’t hurry to explore, soak up the atmosphere, breathe deeply and try to attune your senses to what is going on around you. An Alex Web Inspired Photo. Harsh light required heavy burning in photoshop. It is easy to see how Alex Webb is such an inspiration to me. 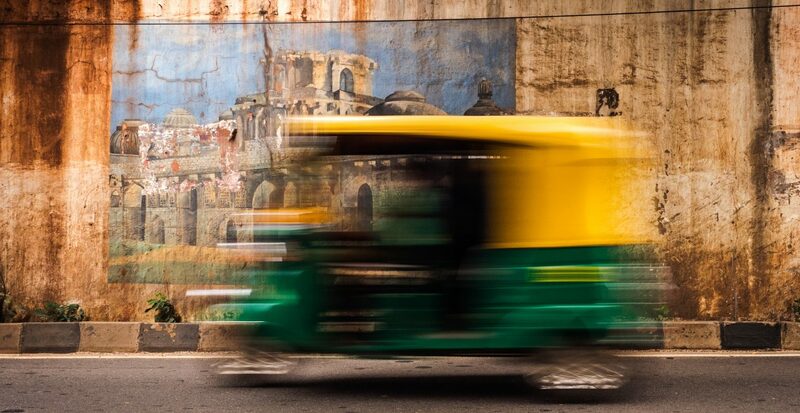 India, my home, shares the harsh sunlight of the tropical locations he has photographed. My adventures also head down through hidden streets and locations, outside the eye of tourist trails. I think that having someone’s work to both study and enjoy can act as a muse for all of us. This is the first of a planned run, where I will look at 10 different, inspirational photographers and try to break down some of their work. Coming next in this series I will be talking about Steve McCurry. If you enjoyed the tips in this article why not have a read of my 10 tips for Street Photographers, although I think it ended around #7! The first of the Tips can be found HERE. Most importantly, did you go to the ridden center and was it delicious? Never heard of the ridden center? Never a problem getting a good curry here though. And I would not have tried the Tiffen Center! (It did not look too hygienic)!